We offer Laboratory Management System - ISO/IEC 17025 Consultancy for Calibration and Testing laboratories. Our company is having more than 100 national and international laboratories as clients who have successfully developed laboratory management system with us and got accredited as per their country's accreditation systems. Our laboratory accreditation - ISO 17025 consultancy services include step-by-step implementation of quality system for calibration and testing lab, auditor training, awareness training to all employees and preparing for documentation requirements as well as internal audit. Our services have helped organizations to achieve quick ISO/IEC 17025 Certification. The ISO 17025 Certification audit is done by accredited certifying body auditors. With micro-level survey of the existing system and conducting awareness training program (top + middle + bottom level), we provide the best laboratory certification consultancy for calibration laboratories as well as testing laboratories. We offer ISO/IEC 17025:2017 documentation kit for Accreditation of Testing Laboratories. This documentation kit contains well-designed set of ready-to-use lab accreditation documents, as per system requirements. 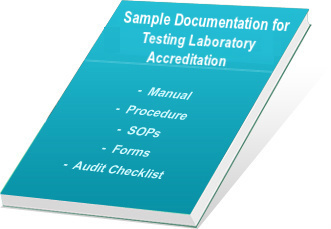 Entire documents for testing laboratory accreditation are written in simple English and quick editable MS Word format. In preparation of ISO 17025 documentation for any size and type of testing lab, our documentation kit can be used as a very useful tool for writing quality manual, procedures, policies, operating instructions and forms. Many companies around the world have already used it and established good working system in their organization. They had easily updated our readymade templates as per their company requirements and within five days their entire documents with all necessary controls were ready. ISO 17025 Audit Checklist (more than 200 questions) - department-wise and requirement-wise audit questions. We offer ISO/IEC 17025:2017 documentation kit for Calibration Laboratories. This documentation kit contains well-designed set of sample lab accreditation documents as per system requirements. Entire ISO 17025 documents for calibration lab accreditation are written in editable MS Word format and in plain English. During implementation and documentation for ISO/IEC 17025, this documentation kit can be a very useful tool for preparing ISO 17025 manual, procedures, policies, operating instructions and forms to establish good working system. Any lab can easily modify our readymade templates as per their requirement, and within five days their entire ISO 17025 documents with all necessary controls will be ready. By using our ISO 17025 documents, you can save a lot of your precious time in documentation process for calibration and testing lab accreditation. Our documentation kit takes care of all the sections and sub-sections of system requirements, and helps you in establishing a better system. Our documentation kit is editable and you are free to change the contents and print as many copies as you need. The users can modify the documents as per their industry's requirements. Using our documents, many companies are implementing ISO 17025 system and getting benefits of certification as improved quality system of calibration and testing laboratories. Readymade templates and sample documents are provided which can reduce your time and cost for document preparation. The audit questions help in making perfect internal audit checklists, as more than 300 auditing questions are given in the documentation kit. You will get better control in your system, as our proven formats and templates are developed under the guidance of our experts. On successful completion of payment process, we provide username and password to download the purchased set of documents from our FTP server. The delivery of our products will be within 12 hours of payment confirmation by secure third party payment gateway.